This month’s Spotlight Stylist is Mak! Mak has been a part of the Van Fam (short for Vanity Family) for five years. Starting off with her apprenticeship, she quickly accelerated her way to the top as Edmondo’s assistant. After several years of studying under Edmondo, Mak received her full time chair as a stylist. Past and present fashion is what inspires Mak, especially creating a Hollywood look with a modern day twist. Mak prides herself on attention to detail, working with all types of blondes, corrective color, and she is no rookie when it comes to balayage. There’s more to Mak than her modern day style. In her free time, she enjoys being around family, and organizing DIY projects with her niece and nephew. Not sure if you’ve seen Mak before? 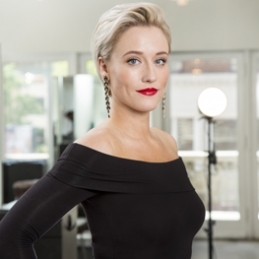 You won’t be able to miss her short distinct platinum hair, and vibrant lip color! Call or stop in today to schedule your next appointment with Mak!